Why is GC calculating a higher wattage than my head unit? I went out and did a threshold test today. my 4th or 5th since I've had my PT hub. Okay, so I'm on the ride, I hit 20 minute mark, and average power on the head unit is 275w. I come home and download the data into Golden Cheetah and the average power for that interval is 289. If I download the data into Power Agent it reads 275w. could you explain a little more about that? It was at 0 nm when I opened that setting, so I adjust down by about -.5 nm to get an average power that matches what the head unit and Power Agent had. How did it get out of whack in the first place? And does the adjustment apply to all ride files or just today's ride file? Last edited by HMF; 01-24-12 at 10:38 PM. Manual settings will only apply to a given ride, I believe. The auto setting will apply to all rides. I'm not sure why it's confused in the first place, if you were at 0nm going in. You might poke around on a GC forum to see if you can learn more about it, or maybe the wattage forum. I was wondering about that last night with my Quarq/Edge 500. The max power number on my head unit, the 'ride summary,' 'ride plot,' and 'metrics (1 second)' pages were all different--aside from the obvious answer of "the highest," which number is most trustworthy? Golden Cheetah and the other software products simply download and display the data in the head unit. They don't calculate anything*. So, that data presented by the software is actually (and ironically) more accurate than that which is presented by the head unit. *Actually the SRM software can re-calculate power if you change the slope of the file, which is helpful if you forget to set the slope before your ride. 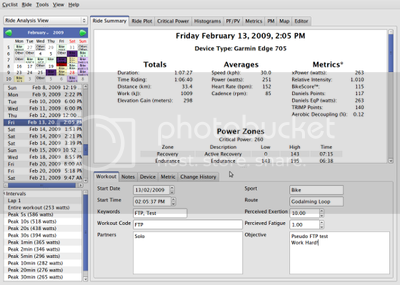 I've reviewed my SRM files in the SRM software, Golden Cheetah, and PowerAgent and they all match 100%. It was the SRM head unit that was off. I've gone line-by-line and can see the actual max values for cadence, speed, torque, power, HR, etc... and have exported to Excel and got the same averages. I think the head units somehow use fuzzy math. That makes sense, thanks. I usually display 3-second power on my head unit anyways, but, can I trust that my peak 1-second power from last night, from the 'metrics' page on GC was accurate? I'm really tired of some of the 705 issues.. I keep thinking of buying a 500 and just throwing the 705 into a stream. Yes. If you go to the page that lists each sample you can scroll to find your peak. I can't recall what that tab is called. But it's the one that looks like an excel spreadsheet. Also, from Golden Cheetah, you can export to .CSV and load the file into CycleOps PowerAgent (free) and get some nice average and max metrics for each slice of your file in the form of a table. I do this when I'm trying to compare similar efforts. Thanks--I ask because I've gotten what are clearly errors in the past (while I would love to think that I have a 2000w sprint, my results suggest otherwise), but this one seems more reasonable. One last thread-jacking question: any idea of why the number from the 'metrics' page would be different from what's listed on the 'max' line in the intervals at the bottom of the 'ride summary' page? I pay close attention to my max wattage and I haven't noticed a discrepancy. I use the Mac version of the software. Also, the 1" max may be different than your absolute max being that the 1" max is an average of 2 samples. 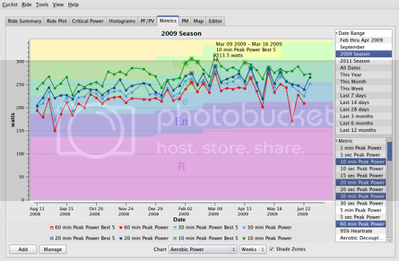 My max on the summary page matches the max on the metrics page, at least for rides I checked. That's both powertap and quarq.